Can you eat the Sea Urchins in the Virgin Islands? I see urchins in sushi restarants a lot. I have seen Andrew Zimmern eat them many times on the travel channel. I do not know the species common in the Virgin Islands and only thing I have read so far is you can eat all species just some taste really bad. So are sea urchins a tasty treat or should I avoid them at all cost? The edible species (it's actually the gonads of both males and females which are the edible part if that's not TMI and enough to turn you off) is found primarily in the cold waters of Europe. To the best of my knowledge the species found here isn't edible. Not poisonous as far as I know so if you want to give it a try do let us know! Sea urchins are an important part of the eco system in the waters. Please don't eat. The fish we eat aren't? Enjoy the fish species du jour while it lasts. As each one gets fished out, we move on to to next. Sea urchins help maintain algae growth in the reef. The reef will smother in algae without the urchins. I have lived here forever and have never seen anyone, native or not, eating our local seas urchins. Thank you everyone. This was very useful. I think I will give it a try and see. I am assuming the worse now, so perhaps I might be surprised. Based on easily accessible data (which you seem not to have explored at all), I caution against this plan. You appear to be one of these, "I'll do what I do whatever" dipshits. Oh, big sigh. But, seriously, don't come to my neck of the woods. Wow that was a little harsh OT. I would also do a little more research on how to prepare them if you do decide to eat them. Diadema antillarum is eaten on many islands in the Caribbean but since 1984 when 95% of them died off because of a pathogen, people consume MUCH less now. They are considered a delicacy in Barbados. Before you start killing Sea Urchins go to a local sushi bar and try some Uni. They say that is an acquired taste but as much as I tried I could never acquire the taste. It is served gunkan style like roe. I like all of the roe but uni has a disgusting flavor. As OT pointed out, uni is the gonads of sea urchin and has the consistency and color of snot. In the West Indies, slate pencil urchins are eaten. Now I know why we don't eat them. ugh! BTW - You'd probably have to eat a lot to make a meal out of them which will probably entail getting sea urchin spines in your fingers. Be prepared to pee on your hand, if that is the case. Uni is frequently served with a quail egg on top. Although this helps mask the flavor of the uni, it is still disgusting. Ikura with a quail egg is delicious, however we do not have salmon here in the Caribbean. 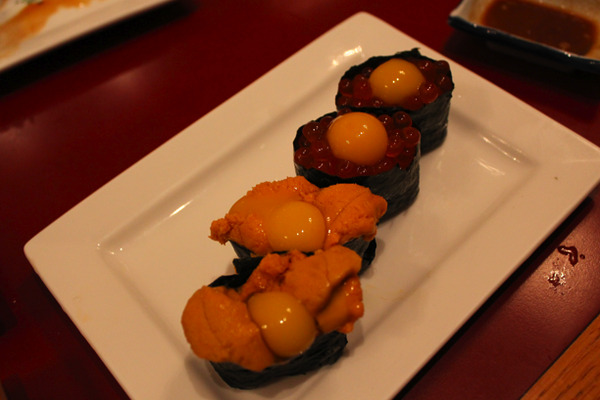 Here you have both Uni and Ikura with quail egg. They say the good uni has the consistency of firm custard but in my experience it is slimier than that. Maybe they save the good stuff for Japan. AandA2VI, Thank you :). That is very interesting, I assume they have made a come back. OT I will get your approval for all my meals for now on to match social norms *-). Nobody has said they are not edible, just they might taste disgusting. Dougtamji, yeah I just looked it up it is a delicacy in Barbados. Apparently 17 different species on the island. Alana, Yeah I do not want to get hurt either. If I have the right kind of glove and tool I will give one a try. Just one. Rotor, Picture looks tasty, thank you for the info. I have tried UNI it was masked with so many other things so I have no idea what it true taste is. Probably why sushi places mask the true flavor is because it taste really gross. I greatly enjoy raw oysters, clams, and many fish. When I was in Japan I greatly enjoyed this fish head dish. Rotor that looks absolutely disgusting. HAHAHA. I laughed so hard. beauty is in the eye of the beholder i guess. I greatly enjoy raw oysters, clams, and many fish. When I was in Japan I greatly enjoyed this fish head dish. I like all of these as well but the VI is not the place for any of these. At least on STX. STT has Beni Iguana and Enkai which have decent sushi, all we have on STX is Dashi((td)). For raw oysters all we have is Tavern at $30/dozen. Seafood is very expensive here, even local species like Tuna, Dolphin and Wahoo. Florida is a MUCH better place for seafood. I love sushi. Every piece is like art. Ikura is one of my favorites. All we have on STX is Tobiko or Masago. I know I am gone now and don't have to worry about it, but would a sea urchin not be very likely to give you ciguatera? When we were there, we avoided ALL reef fish, but I'm nervous that way. Ciguatera is a good point. As a newbie on this I would only assume that there is hardly any meat to consume so not to worry. If it had ciguatera it would take about a thousand of them to make an impact. Also if urchins have it so should conchs which I understand many people enjoy eating. I did include I am a newbie so hopefully someone else can way in on that? Rotor glad we have a lot of the same taste. I was not expecting much in the food department on STX. I was just hoping to try some new local interesting things. poodle that is interesting I am going to look into that. I do not think that one has to eat much of anything affected by ciguatera in order to contract the systems. Google it plus there are other threads on this link. That might be a good idea, if you plan on eating things that a fragile eco system is dependent on. You could make an argument an ecosystem is dependent on all species, but that is not a valid argument. If OT would have gave me a reasonable logical reason I would reconsider. Calling me a "dipshit" shows how mature that person truly is. We do have a fragile ecosystem and many newcomers do not either know or care about it. Neither do many locals so it is important that to those of us that actually do live here and strive to do the right things that we do not have just the general lurking, come here for a short time, don't give a crap types embedding on our very fragile environment and don't either know or give 2 cents about it as long as it "suits" them. Not saying you are one of those but it does go without saying we see too many.